These two words can strike fear into the heart of any scrapper, but I happen to love organization and the challenges it brings. 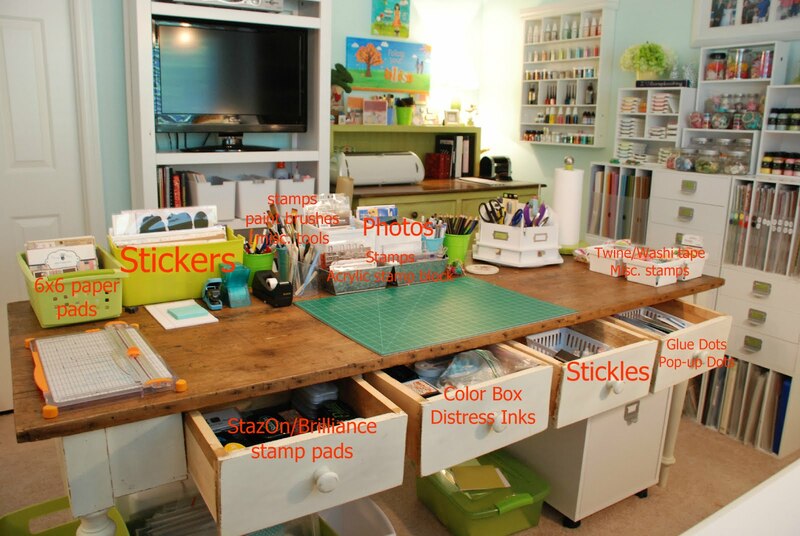 As all hoarders/scrappers know, the hardest thing is to stay organized while trying to scrap, purge, and introduce new products into your space. I do purge quite often (I happen to love shows like, Clean House and Hoarders), they remind me to let some things go that I know I will NEVER use. I must tell you that my first scraproom was my dining room table and then I graduated to my unfinished basement with a space heater and folding tables. My point is, no matter what the size or state of your current space, organization is the key (in my opinion) to making it work. Although I did make a video of scraproom organization here, I have since acquired a passion for mixed media, as well, so I had to do some shifting in my space. I thought I would share with you some detailed pics of the end result. These nifty little bins from Target are great! When I'm painting, I just pull out the bin and have all my paints, pens, etc. right at my fingertips. This is how I store my scraps. It's so easy - just grab a folder out and flip through to see what's available! Look at these adorable ceramic fruit baskets (I need a few more of these!) They're perfect for twine, washi tape, etc. I've decided to turn the area above my cutting station into my mixed media wall. It's great because it's tucked away and I can just add pieces as I create them. I hope there is something I've shared that you'll find useful. I would love to hear/see how you organize your space. Please feel free to share your comments or even better, put a link in the comments to your space! Great tips. 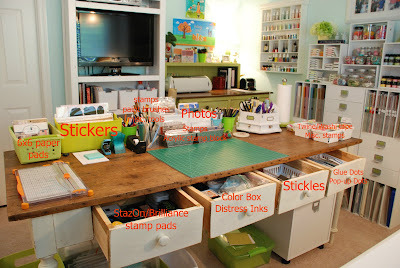 I like the idea of having an empty artbin to clean up quickly when needed. Love love love your room. It must be so much fun to scrap in there! Wow! Gorgeous room and awesome organization!! So inspiring! It all looks so very orderly - well done. I store my scraps the same way you do. I doubt I keep things as cleared and put away as you do though. Girl, when are you making the trip here to organize for me? I can't believe how super organized you are! I have some of those target bins in green too... love those! Wow! What an amazing room! What a great space! 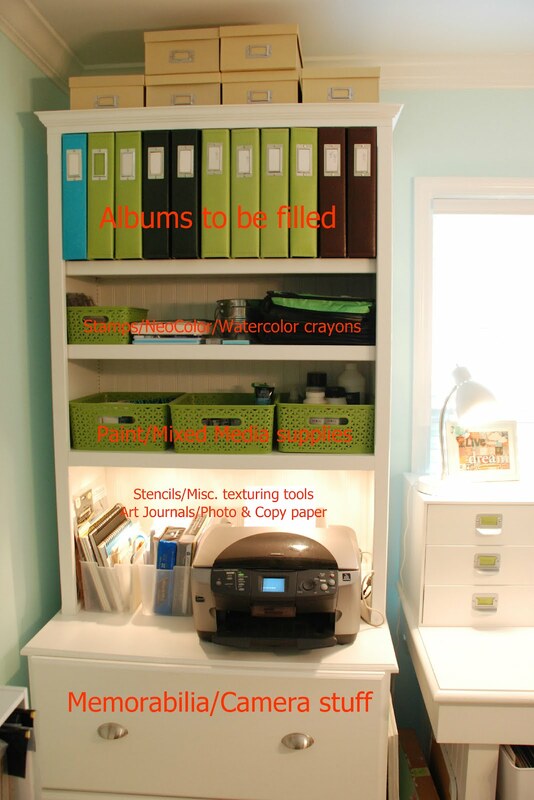 And love that you provide such a fabulous "tour" of your space with the photos & labels above! I love your space!Everything seems to have a place of its own. I love looking at your space. It is truly amazing to see such an organized space! Oh Sherry, your scrap space is to die for! Love it and thanks for sharing!